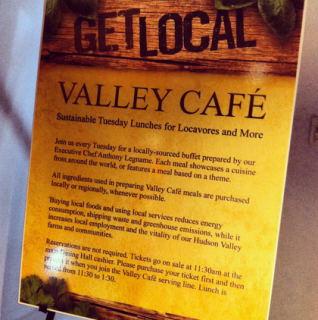 Sustainable Tuesday Lunches for Locavores and More—is a locally-sourced buffet prepared by our Executive Chef Anthony Legname. Each meal showcases a different cuisine from around the world, or features a meal based on a theme. All ingredients used in preparing Valley Café dishes are purchased locally or regionally, whenever possible. The Valley Café buffet is served in the Cabaret Lounge, from 11:30am to 1:30pm.